If you have any questions about the PETARA information page below please contact us. Coming from the Proteksan Turquoise Yachts yacht builder in Turkey the PETARA is 54 metre 176 (foot) in length. Launched to celebration in the year of 2002 this boat’s interior design demonstrates the distinction from Donald Starkey Designs and their approach to interior yacht design. Superyacht PETARA can accommodate up to 12 passengers with 11 crew members. Her former names or project names were Pegaso. She will attain a high speed of 16 knots. Dubois Naval Architects was the naval architect firm involved in the technical superyacht plans for PETARA. Also the company Dubois Naval Architects expertly collaborated on this undertaking. Interior designer Donald Starkey Designs was employed for the overall internal ambience. In 2002 she was actually launched with accolade in Istanbul and following sea trials and finishing touches was afterwards passed on to the owner who commissioned her. Proteksan Turquoise Yachts completed their new build motor yacht in Turkey. The main hull was constructed with steel. The motor yacht superstructure is fabricated extensively from aluminium. With a beam of 9.3 metres or 30.5 ft PETARA has spacious interior. She has a deep draught of 3.1m (10.2ft). The 3512B DITA engine powering the yacht is built by CATERPILLAR. Connected to her Caterpillar engine(s) are twin screw propellers. The engine of the yacht generates 1520 horse power (or 1118 kilowatts). She is fitted with 2 engines. The sum thrust for the boat is therefore 3040 HP / 2237 KW. Offering chambers for a limit of 12 welcome guests overnighting, the PETARA accommodates everyone in luxury. This ship has room for approx 11 professional yacht crew to manage. 53.5 metres / 175.5 feet. The main engines are two 1520 Horse Power or 1118 Kilowatts Caterpillar. The Model type is 3512B DITA diesel. Approximate Cruise Speed is 15 nautical miles per hour. 3500 at a speed of 15 knots. Leroy Somer 2 times 160 kilowatts. On Sept 2009 PETARA cruised to Piraeus, in Greece. This motor yacht has traveled the location encompassing Attikí during the month of October 2009. Her deck material is predominantly a teak deck. 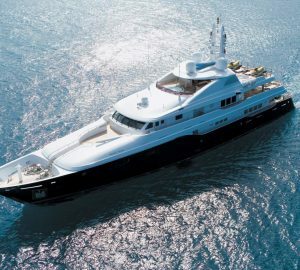 The luxury yacht PETARA displayed on this page is merely informational and she is not necessarily available for yacht charter or for sale, nor is she represented or marketed in anyway by CharterWorld. This web page and the superyacht information contained herein is not contractual. All yacht specifications and informations are displayed in good faith but CharterWorld does not warrant or assume any legal liability or responsibility for the current accuracy, completeness, validity, or usefulness of any superyacht information and/or images displayed. All boat information is subject to change without prior notice and may not be current.